Description: Several licenced Fisher-Price books were made featuring Little People Characters. The "Lucky and the Dog Show" is a square soft cover book with brightly colored realistic Little People characters: Penny (green girl with blonde hair), Timmy (orange boy with brown hair), and Lucky (Black dig with whte face and red collar). See what happens when Penny and Timmy decide to enter their dog Lucky into the local dog show! FPT5161 - Soft cover book with a light blue cover that has a picture of Penny and Timmy putting bows and ribbons on their dog Lucky. The top of the book has a red Fisher-Price awning bar and the words "Lucky and the Dog Show" in red. Published by Marvel Books, Written by Jon Chardiet, and Illustrated by Manny Campana. Measures 8" tall x 8" wide. 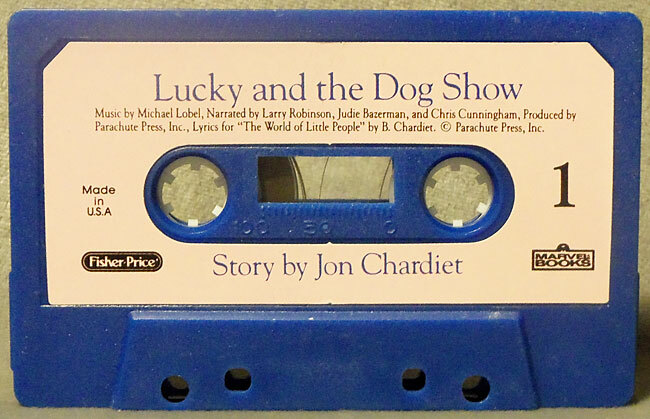 FPT22173 - Blue cassette tape with pink label called "Luck and the Dog Show". FPT45297 - Mint on card set.